Why Is GM Having So Much Trouble Selling The Corvette In Australia? Apparently the Corvette's logo is a big problem. Australia has produced its share of amazing vehicles over the years. Many Holden products have borrowed engines from the Corvette, although surprisingly GM does not sell the Vette in the land Down Under. 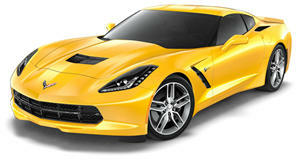 The current C7 Corvette is not sold in Australia's right-hand-drive market because of engineering difficulties. Even though the current car isn't sold in the country, GM is rumored to be working on bringing the next generation C8 Corvette to Australia. Now however, GM is having trouble trademarking the Corvette logo. Australian magazine Wheels reports that GM has spent "tens of thousands of dollars" trying to gain approval for the Corvette's twin-flag emblem. The government body that is in charge of trademarks in Australia claims that the bowtie in the Corvette's emblem looks too much like the Red Cross. According to the 1957 Geneva Act, the Red Cross can only be used in times of conflict to symbolize a medical vehicle that should not be fired on. GM has faced difficulties getting approval for the Corvette, but could gain approval by filing a divisional application which could grant the car an exemption because it does not relate at all to medical wartime vehicles. Clearly GM will be thinking globally with the next generation Corvette, although there are still many mysteries about what the new C8 will look like. All signs seem to point to a mid-engined layout, but there are still a lot of question marks over the powertrain. If the Corvette did make it to Australia, it could potentially wear a Holden badge, which would be an interesting turn of events. We know Holden wants a dedicated sports car, but could a rebadged Corvette be that car?